I am all about following what’s the latest and greatest in the apple world. There are new varieties coming out all the time. Everyone wants to have the next Honeycrisp. 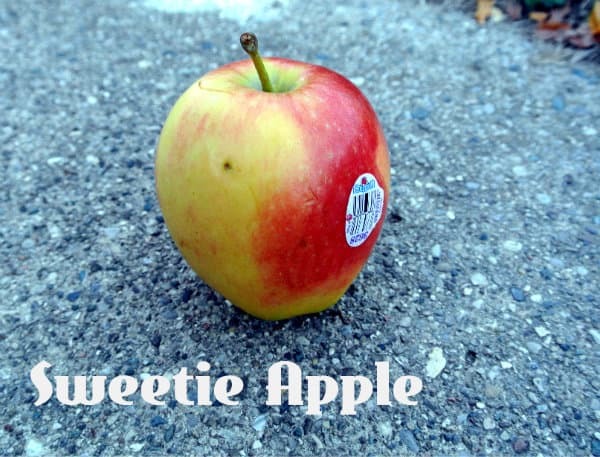 Broetje Orchards in Washington are growing a new apple called the Sweetie. It is distributed by First Fruits Marketing. They also released the Opal apple a few years back. The apple itself originated in New Zealand. No. They were made by crossing a Gala and a Braeburn the old fashion way. As of now they are no commercially available genetically modified apples (read my post on GMOs & Apples). Overall Feeling: This apple sure lives up to it’s name. It is super sweet, crisp, and juicy. One of the sweetest apples I ever had. But really no tartness to balance that and in the end no real flavor. It was like eating water. I couldn’t wait to be done with it. I have no desire to try one of these apples again. It does look pretty and has the sweet, crisp, and juicy elements that people seem to ask for. Have our standards gotten so low that those are all we care about and flavor doesn’t come into the equation? Are Sweetie Apples Good for Cooking or Baking? In my opinion the only useful thing this apple may have is added to a batch of applesauce containing tart apples, to add some sweetness. They are way too sweet and flavorless to bake with. Already exists. Called a Sweet Tango.